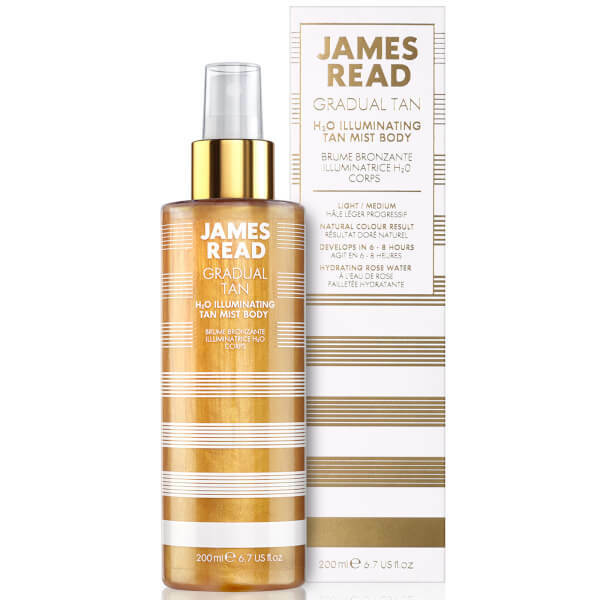 Reveal radiant, glowing skin with the James Read H2O Illuminating Tan Mist; a lightweight body tanner with an enviable, lustrous finish. Formulated with a base of Organic Rose Water, the ultra-hydrating gradual tan effortlessly spritzes over skin, absorbing quickly and developing into a natural-looking, bronzed glow. 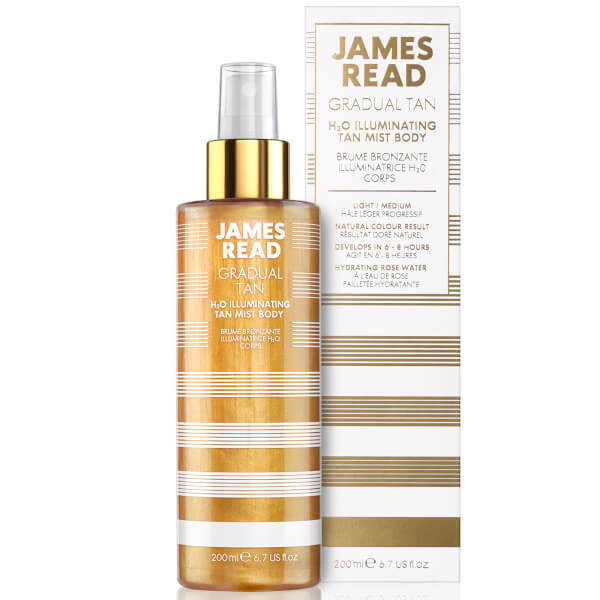 The luxurious, golden formula is infused with light reflecting particles, which instantly deliver a shimmering veil to the body that completes any tan. 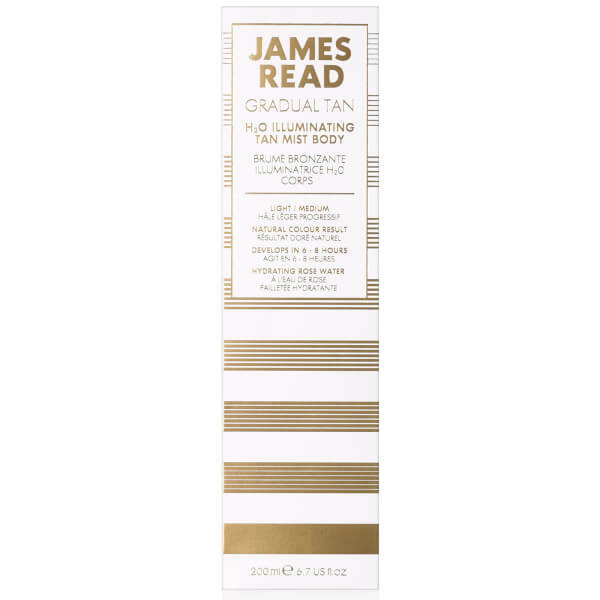 Utilising James Read’s Tantone Technology™, the mist tailors the tanning result to your natural skin tone in order to deliver the most natural-looking result. Expect a beautiful bronzed glow to appear gradually and last up to five days. Exfoliate thoroughly prior to application. Shake the bottle to activate the shimmer particles. Hold nozzle at arm’s length from the skin and spray onto each section of the body. Start with the chest and stomach and then each arm and leg. Ensure the product has been applied all over then lightly spritz feet and hands to finish. Wait until skin is touch dry before dressing. Avoid contact with water for 8 hours and then rinse. Aqua/Water/Eau, Alcohol Denat., Dihydroxyacetone, Propylene Glycol, PEG-7 Glyceryl Cocoate, Caffeine, Dimethyl Isosorbide, Hydrolyzed Jojoba Esters, Citric Acid, Parfum (Fragrance), Panthenol (Provitamin B5), Polysorbate 20, Glycol Distearate, Sodium Metabisulfite, Sodium Benzoate, Erythrulose, Synthetic Fluorphlogopite, Laureth-4, Potassium Sorbate, Cocamidopropyl Betaine, Xanthan Gum, Anthemis Nobilis Flower Extract, Rosa Damascena Flower Oil, Sodium Chloride, Phenoxyethanol, Ethylhexylglycerin, Gold, Linalool, Coumarin, Alpha-Isomethyl Ionone, Benzyl Salicylate, Hexyl Cinnamal, Tin Oxide, CI 77891 [Titanium Dioxide], CI 77491 [Iron Oxides], CI 15985 [Yellow 6].